The Doctor's bag is an absolute classic that never goes out of fashion. 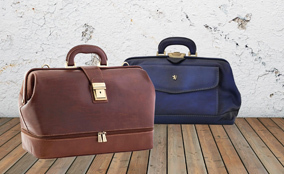 Here is our range of handcrafted bags made in the finest Italian leathers by artisans at Pratesi, Chiarugi and Pellevera who are all based in Tuscany, Italy. This beautiful collection comes in a range of colours, styles and sizes. So whether you're looking to use it as a holdall, business bag or handbag, there will be something here to suit you. The perfect accessory that will never date.